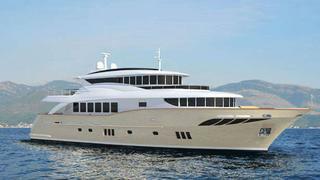 Filippetti Yacht's newest addition to its Green Series, the Navetta 30, is under construction with a delivery date scheduled for 2014. This is the second yacht in the eco-friendly series from Filippetti, the first being the Navetta 26 launched in December 2010. With a focus on environmental sustainability, the eco-friendly Green Series vessels are produced with the aim of reducing emissions and fuel consumption. The the new 30m displacement superyacht will have large fuel tank capacity of 25,000 litres, allow for long-distance cruising. The tri-deck yacht accommodates owner and guests in five cabins, large lounge areas on both the main and upper decks, as well plenty of outside living space equipped with sofas and sunbathing areas. A highlight is the expansive main-deck owner’s cabin. The design maximises the use of space and natural light, with windows running 180-degrees around the cabin providing panoramic views to sea.